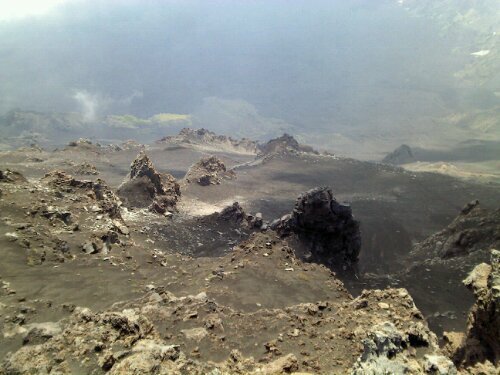 I woke with dreams of summiting Etna and walking the rim of one of the main craters, but the reality of my blistered feet kept me from lacing up my boots too quickly. I decided to push on but only go as far as I was enjoying myself. Plus, I really didn’t have a solid plan about how I was going to get back to Catania, and I had no idea how far I would need to walk to make that happen. Against my initial plans, I took the cable car up about 500 meters, as there was no way I would be able to climb that section with my blisters. 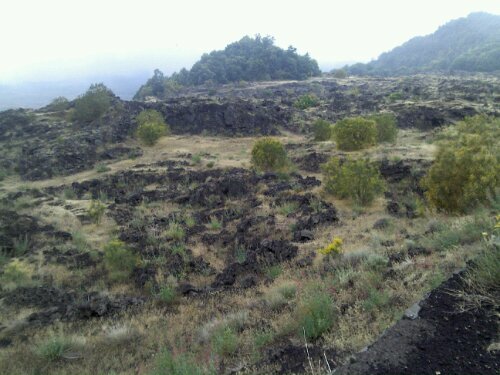 However, I turned down the option of the mega-jeep bus thing that takes you right up close to the volcano rim. I wanted to at least attempt that under my own power. 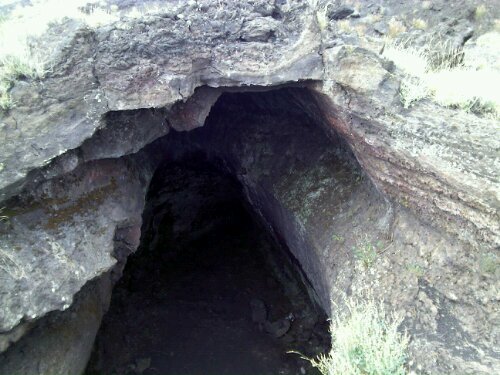 I had heard that you may not be allowed to walk up or around on the mountain without a guide. As it turns out, that is simply not true. You can go wherever you like up there, and no one even asks you where you are headed. It makes sense; Etna is too big for that level of control. 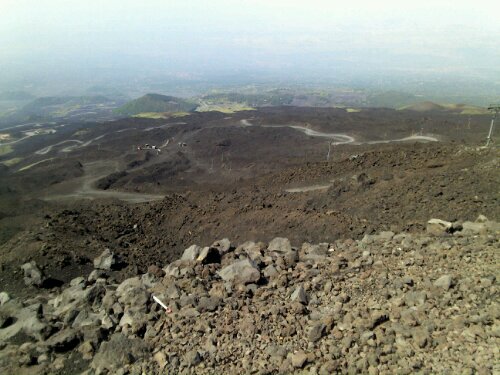 A few hundred meters from the top, I hit the limit of what I could do and still have a good chance to get off the mountain under my own power. 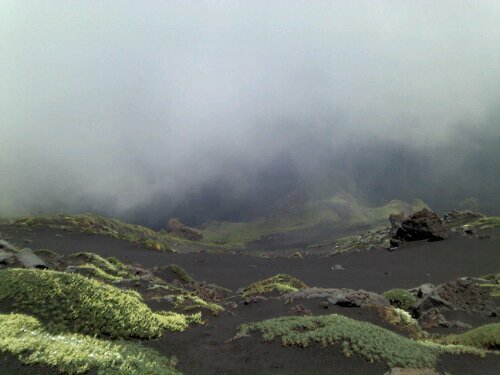 I found a nearby smaller crater and poured the small bottle of seawater that I brought from Catania. It disappeared immediately into the little rocks beneath my feet. Due to where my blisters were located, I found that I could walk downhill without the same level of pain. I aimed for a town on the east side of the mountain, Zafferena Etnea. Wanting to see as much between here and there, I attempted to find a winter ski run that would serve as a ridgeline trail, eventually connecting with the road to Zaff. Well, I found the trail for a while, but it eventually gave out, leaving me the option of going back up (no way) or making my own way through the rocks and scrub. 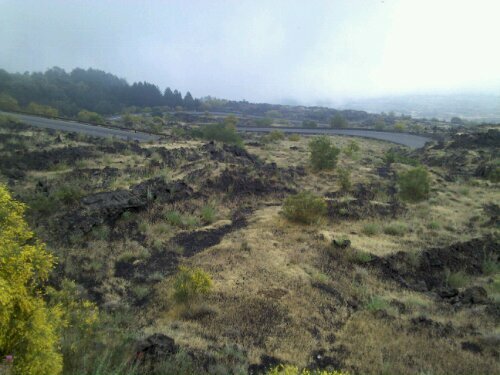 I quickly found the road that I was looking for below me, but then clouds rolled in, limiting my view to perhaps 50 feet, and I lost sight of it. I kept going by dead reckoning until I found it again. Approaching the road was the most dangerous part – the ground was steep and covered with large, irregular rocks, holes, and thick foliage. Somehow, I made it down without falling or breaking an ankle. The road down to Zaff was more scenic than the road up to Rifugio Sapienza, and it helped take my pain off of my blisters. I covered the 8 miles in about 3 hours, eager to make sure I had enough time to find a bus back to Catania – there was no way I could make that last 12 miles on foot. I made it back to Catania later that evening and was able to bandage my feet and even track down a beer or three before all of the shops closed. 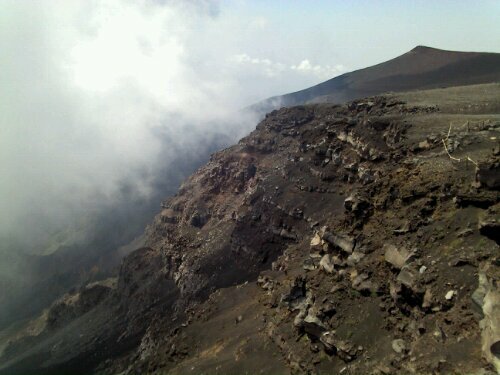 While I didn’t make the summit or transverse Etna from south to north, I had a great time, saw some wonderful vistas, and enjoyed the adventure I was craving. 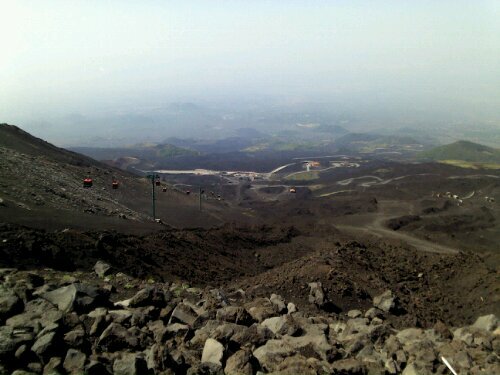 The next time I’m in Sicily, though, look out, Etna. I’ve got your number now. Sounds like a wonderful adventure. I hope your feet are much better.